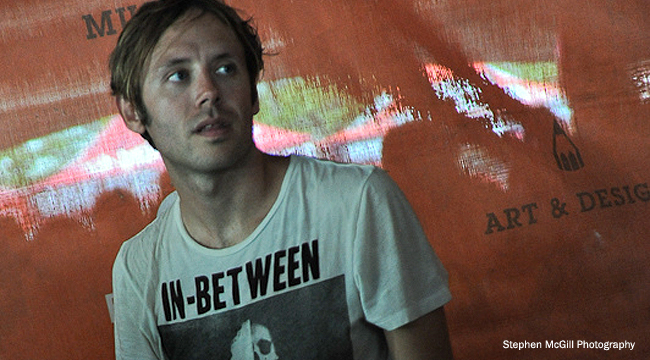 Over the summer, Thursday singer Geoff Rickly revealed a new side to his musical repertoire and performed on the Warped Tour “Acoustic Basement” stage, a new component to the traveling festival known for its emo and screamo acts. Now, several artists who toured together over the summer have gotten together for a club tour. Rickly, who will share a bill with Koji, I Am the Avalanche/The Movielife’s Vinnie Caruana, and Therefore I Am’s Brian Marquis, recently phoned in to talk about the music he’s been making in the wake of the dissolution of the screamo act that he fronted for 15 years. Talk about what it’s been like for you to transition to playing acoustic. What was your first acoustic show like? It was March of last year and a promoter in Dallas told me he hosts an acoustic show. I told him I was into the idea, but I just didn’t play guitar. He told me to think about it. I thought it was a cool idea so I learned a bunch of songs and I was pretty crap at it. My feet shook so bad because I was so nervous to be on stage alone that I could barley keep a beat. And those were Thursday songs that I played a million times. I kept playing with no expectation of doing it live again. I was just doing it at home and getting to know the guitar better. I wrote a few songs that I really liked and then I got an invite to do the Acoustic Basement stage on Warped Tour. I was a little skeptical and I thought it would be so loud nobody would hear. But then I thought that would be perfect for me. I realized I could do it and on a recent tour with [Circa Survive singer] Anthony Green I let go of my stage fright. I realize I’m not going to be the best guitar player and I’m not the most technical singer. The thing that’s great about playing acoustic is that you’re just a person there telling a story and you can bring lulls to the music and then explode out of nowhere. People react on a more personal level when there’s not a giant light show and a huge loud band and all these things that are overwhelming your senses. I can engage people’s nervous systems. It’s like if you’re having a conversation and someone starts yelling at you. You just don’t know why they’re yelling at you. The challenges are many because I’m not a good guitar player and I don’t have great coordination. I’m more nervous than people would guess. The reason I was confident with Thursday was because I had great musicians around. Are you playing mostly Thursday songs or mostly solo songs? I released a mixtape earlier this year and I’m releasing another one pretty soon. They’re all free and you can download them either from my website or from Bandcamp. I’m playing a few songs from that, some covers and two or three Thursday songs. I’m still rewriting the set for the new tour because enough people have seen me now that I should throw in a few new things. It’s cool though, and I think part way through the tour there will be some collaborations, too. Did your set evolve over the summer when you were on the Warped Tour, too? It changed throughout. In the beginning, I was doing a Buzzcocks’ cover and then I realized the Buzzcocks weren’t really different for me. They’re something that Thursday used to cover. So then I started doing an Usher song and doing it my way and that felt a lot more exciting. I wrote a song while we were on Warped Tour and that’s become a favorite of the live set. That’s the cool thing about this tour is that you can just decide a song is ready and play it that day. Had you appreciated other acoustic performances? I always liked singer-songwriters and when I was a kid, the first show I ever saw when I was 5 and I saw Jackson Browne opening for Crosby, Stills, Nash and Young. That was very folky. My parents are professors and they’re very into humanitarian stuff. We saw James Taylor play at the UN and things like that. The first real love I ever had was Leonard Cohen. I’ve always liked that stuff. There’s more recent stuff that I haven’t love quite as much, but I think M. Ward is really fantastic, especially a couple of records ago when he hit a great stride. A lot of those people who go into solo stuff are fantastic guitar players or really good singers like Jeff Buckley. I’m neither, so I have to forget about what I think my idea of a solo show should be and go with what I’m good at, which is telling a story and surprising people at a certain moment and allowing a certain bit of drama to enter into the show. If I concentrate at getting better at playing guitar, which I do every night anyway, that’s not going to make a huge difference. I still won’t be as good as M. Ward or any of those people. The vibe of giving away the music and going out and playing feels really good . . . So do you have anything other than the mixtape coming out? The first mixtape came out at Thanksgiving. The second will come out either before this tour or just afterwards. It depends on how many songs I want to record for it. I’ll probably do another mixtape around summer or winter. A few other mixtapes. I spread them out and they’re all free. I might collect them and put them out on vinyl or do a real record. The vibe of giving away the music and going out and playing feels really good after this cycle of “now we’ve recorded a record, now we wait three months and market the record, and now we release the record and tour the record.” I just don’t want to do that right now. It sounds like you miss your band mates in Thursday but not that routine. I miss those guys. I miss the music and the chemistry on stage. There are so many things I miss, but the thing I don’t miss is the industry B.S. I don’t miss the industry B.S. I don’t miss the fact that every decision we made as a band was split six ways and it took six months to make a decision. I was just on vacation in Puerto Rico and someone said, “You should play a show.” And I said, “I’ll play.” It was crazy. It was so much fun and kids knew the songs and Thursday had never gone to Puerto Rico. Now, I could go to Russia if I wanted. I could go to places I’ve never been.